I am 19 years old from Arlington, VA. 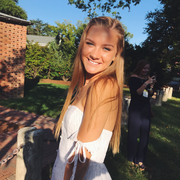 I am currently a sophomore at William and Mary, majoring in Neuroscience on a pre med track. I started babysitting around age 10 for my younger brother, and continued throughout middle school and high school for families in and around my neighborhood. I also have experience nannying several children every day for a few weeks in Nantucket during the past two summers. I really enjoy doing creative things, such as painting and drawing, and doing things outdoors, such as going for long walks or hikes. I am fun-loving and highly adaptable to new situations, which lends itself well to working with children. My experience babysitting and nannying has made me eager to continue meeting new families and gaining more experience!